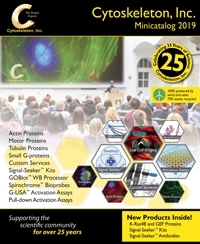 Introducing the New 2019 Cytoskeleton Minicatalog! New products = new discoveries! 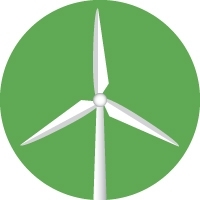 Renewable Energy and Recycling at Cytoskeleton, Inc. In 2019, Cytoskeleton made the move to power its sole facility at Denver, Colorado, USA with 100% renewable energy (wind and solar). The local electric company (Xcel energy) has enabled this by its Colorado State mandate to produce 30% of its electricity from wind and solar by 2020 (and 100% by 2040). We are proud to support the 2016 Paris Agreement on Climate Change with this change. In addition, late in 2018 a recycling program was started at Cytoskeleton. To date we achieve 75% recycled waste, while looking for more ways to recycle the remainder. More changes will take place to utilize post-consumer materials wherever possible. We look forward to a peaceful, efficient and productive scientific culture in 2019 and beyond. The Team at Cytoskeleton, Inc.